I'd love to win I Spy Private Eye. 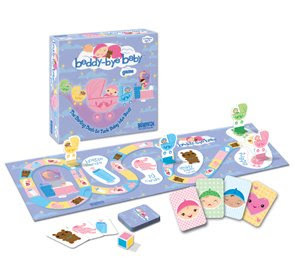 Beddy Bye Baby is a board game that is totally irresistible to little girls. Its simple goal is to collect cards representing the necessities (bottles, PJs and lovey bears) so that you will have everything on hand when your baby needs it with the ultimate goal of putting that little tyke to sleep. It's basically the board game equivalent of playing with baby dolls and Roo loves it. I was surprised at how much fun we had playing it all together as a family. I didn't even mind when she wanted to play it over and over again…it's definitely much more fun than putting a real baby to bed! Another fun game by Briarpatch that we were able to try is I Spy Private Eye, which combines the elements of memory card games with the cube-juggling fun of Boggle. A built-in timer gives you thirty seconds to memorize all of the pictures on the nine cubes, then you pick a card and see how many items you can remember. The competition gets pretty heated, for both kids and adults! To enter and win your choice of either Beddy Bye Baby or I Spy Private Eye, please comment on this post with which game you would like to win, plus your other favorite game from Briarpatch. There will be one winner for each game! Entries will be accepted through September 24th and I'll pick the winner using Random.org. US readers are eligible. Only one entry/comment per person, please. Both games look fun, but I think with my grandson I Spy Private Eye would be my choice. I think Beddy Bye Baby would be a hit at our house. I also think that Animal Soup looks like it would be a lot of fun. I think my daughter would LOVE the Beddy Bye Baby game!! The beddy bye baby looks fun. I wish I had someone to play board games with, but I guess that something to look forward to when Soren grows up. The game reminds me a little of Candyland. ella would love the i spy! and she would also love the Goodnight Moon Game! The Beddy Bye Baby game looks so good! I also like the Goodnight Moon game, my daughter is fascinated with this book so I am sure the game would be the same. I would love to win the Beddy Bye Baby game for my little girl!! I was going to say the Goodnight Moon game would be fun, but everyone else has also chosen that, so I'll say the Golden Books Little Cirlce of Friends game! I used to love those books!!! This is a great website with such fun games! Would love the I SPY private eye game. My son and I love the books so I'm sure the game will be a hit! I'm eyeing the I Spy Private Eye. 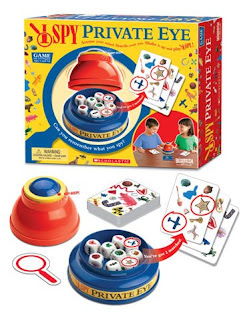 My son loves anything I Spy, so would love to have the I Spy Private Eye game. The Sea Monsters game looks really cool as well. We would go with the I Spy Private Eye game. I want to win I Spy Private eye. I also like Goodnight Moon. I'd love to have Circle of Friends.. as for the giveaway.. hmm.. it would be a present for one of Connor's cousins for christmas... so either would be fabulous but if I had to choose the I spy prol! We love the Good Night Moon book. I would like to try the game. We would like to try the I Spy game. We also like the clothespin game. Thanks for the chance. I also like the I spy game. Thank you for this giveaway. If I won, I'd love the I Spy Game. Another game that I think my kids would love is the Animal Soup game. Thanks so much. Would like the i spy one and also the good night moon. I would love the Beddy Bye Bye to play with my granddaughter. My oter favorite game would be the A Little Golden Book Circle of Friends Game. 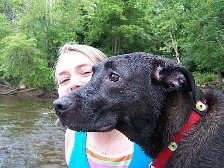 Thank you so much for the contest! my kids love i spy games. I would love the beddy bye baby. DaVinci's Challenge looks neat. Beddy Bye Baby Game. THANKS! I would love to say that my children would love I Spy Private Eye, but it's really me! I love I Spy! I would love to win I Spy Private Eye and the Fancy Nancy Posh Bedroom game looks like a winner! Would love to win I Spy Private Eye game. I'd most like to win I Spy Private Eye and also like the Nerdy Wordy Crossword Game from the BriarPatch site. I know my daughter would love the Beddy Bye Baby game. The Fancy Nancy posh bedroom game would also thrill her. Animal Soup There's Always One Game sounds cute!!! I'd choose the I Spy game for my son! I'd love to win for him! The Fancy Nancy posh bedroom game for my daughter. The i spy game, my son is totally into I Spy right now!! I'd like the I Spy Private Eye out of the two, and i love any of the "girly" games, meaning any of the Fancy Nancy ones, but especially the Fancy Nancy Posh Bedroom Game. Looks so fun! I SPY Private Eye for my daughter! Thanks. I'd love to win I Spy Private Eye for my little boy. Also, the Animal Soup card game looks like fun! Animal Soup looks like fun and I'd love either of the games. (My daughter would probably like Beddy Bye Baby the best, though). The Good Night Moon game is fun, although my daughter would probably prefer the new Fancy Nancy game to it. We would like the Beddy Bye Baby game best. My little guy would LOVE the Eye Spy Private Eye Game. The Sea Monsters game looks so cute! We love our Eye Spy Preschool Game. And Beddy-Bye Baby would be fun, too!! Thanks! I like the Goodnight moon game. I also like all the I Spy games. Either game would be great but I might be leaning more towards the beddy bye baby game. I also like the looks of animal soup. Looks fun. Beddy bye bye is my favourite please, I love the Melissa and Doug things on Briarpatch, especially the pull along alphabet block cart. I love the card games, like the Thomas and friends and animal soup. I'd love either game - I love them both, thabks for the contest. The Beddy Bye Baby game would be a big hit here! I also think we'd love the Goodnight Moon game! I would love the I Spy game for my son, he loves these books. Another Briarpatch game that is amazing is Dinosaurs, Extinct? Beddy Bye looks pretty cute, maybe it'd even be an inspiration? My fave game from this awesome retailer has to be Sea Monsters. It looks so fun. I wanna play! Honestly, either game would be great. I also think my kids would love the Goodnight Moon 24 Piece Puzzle Assortment. They both just love that book! If I were fortunate enough to win, I would choose the I Spy Private Eye game! The Sea Monster game looks good too! BRIARPATCH has won over 250 awards for product excellence! My boys would love the I Spy game. I think the animal soup game would be a hit too! My little game lover would enjoy the I Spy game. One of my favorites from Briar Patch aside from these two is the Good Night Moon boardgame. Thanks for hosting! I would choose Beddy-Bye Baby. From the site, I like the Fancy Nancy Posh Bedroom game. My daughter would love Beddy Bye Baby, too! Fancy Nancy Posh Bedroom Game looks like girly fun, as well! We would really enjoy the I Spy Private Eye game. Also the Sea Monsters game looks really great as well. Thanks for the giveaway. I would love to win Beddy Bye Baby. I also really like the Goodnight Moon game. I spy private eye for us. We also like the Animal soup card game. I would like to win the Beddy Bye Baby Game, I also like the Goodnight Moon Game! Eye Spy, and also Animal Soup looks like a fun twist on Memory. I would love to win I Spy for Private Eye for my boys and the Clothespins game looks fun too. khong0707 at yahoo dot com. I'd love to win the Beddy Bye Baby game for my daughter. Also, the Alphabet Soup game looks like one she would enjoy, too. I would choose the Eye Spy Private Eye. I also love the Fancy Nancy card game. I would like to win the Beddy Bye Baby game and I think the I Spy Bingo would be great fun to play with my daughters. I Spy Private Eye and Beddy Bye Baby game. My son would love the I Spy Private Eye Game and I also love the Thomas Great Race Game I saw on the website. I would like to win I Spy Private Eye. Wordy Nerdy also looks fun! I would like to win "I Spy Private Eye." The Goodnight Moon Game also looks like it would be fun for the kids. My son loves the I Spy books so I'm going to go with the I Spy Private Eye game. I'd love to win the Eye Spy game! We also have the Clothespin game by Briarpatch, it's really cute! I Spy is my daughters favorite and she's only 2! Animal soup looks cute too. I love the Beddy Bye Game. It looks adorable. 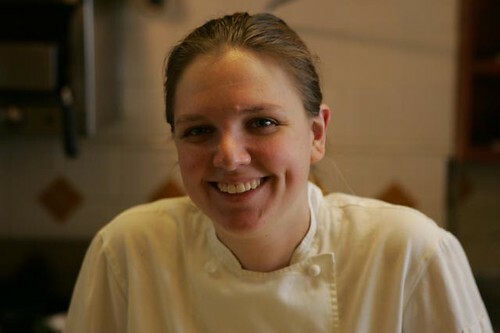 On the site, there are so many wonderful ones to choose from. I have the Goodnight Moon book and it is one of my very favorites to read to children so I would want to choose the Goodnight Moon game. I would love to let my daughter try the Fancy Nancy Posh Bedroom Game. If I were to win I would love the I Spy game. Thank you! Beddy Bye Baby. I also love the Clothespins game they carry. I Spy Private Eye would be my first choise so that my son would enjoy playing with his sisters. I love the I Spy Go Fish game at Briarpatch. We've been playing it for years. If I win, I'd like I Spy Private Eye. My favorite game would be DaVinci's Challenge! Thanks! I would pick the I Spy game. I love Go fish! We would love I Spy Private Eye if we won! We also are really interested in DaVinci's Challenge from Briarpatch. That would be fun for the adults in the house! We would like the I Spy Private Eye game. The Beddie Bye Baby and DaVinci's Challenge from Briarpatch. My granddaughter would love to have the Beddy Bye Baby game. At Briarpatch we also like Clothespins! Thanks for the chance to win your great giveaway! Both games look fun, but I think with my grandkids I Spy Private Eye would be my choice. Would love either, especially Eye Spy. I also like Animal Soup. Animal soup is one of my kids favorite games! Sea Monsters and would love to win the I spy game! Thanks for the contest! I would love the I Spy Private Eye game! My other favorite is the Goodnight Moon Game! either game would be great but it seems that I spy would grow with the kids longer. I would love to have the I Spy Private Eye game. Dinosaurs, Extinct? looks interesting. Thanks! I would choose Beddy Bye Baby. I also like the I Spy Preschool Game. I would like the Eye Spy Public Eye game. I Spy Spooky Night looks great. Thanks for the giveaway, I'd love to win I Spy Private Eye. I'd like to win the I SPY,PRIVATE EYE game. I would love to win the I Spy game for my kids. If I were to win, I'd have to choose the I Spy game. My 4 year old son and I always play this game in the car & read all the I Spy books. Another Briarpatch game that looks really good is, of course, an I Spy game - the I Spy "Word Scramble" Game is my next pick. Thanks for hosting. my kids would love the eye spy, private eye. i love the way it helps build memory without becoming a teaching lesson. Also, the Animal Soup There's Always One Game looks like it would be super fun for all of them! My grandkids would love the I Spy, Private Eye game. I plan on buying the Goodnight Moon game for them for Christmas. Both look like lots of fun! My favorite game is Dinosaurs, Extinct? I'd like to win the I Spy Private Eye game. Thanks! I'd like to win the I Spy Private Eye, my other favorite is DaVinci's Challenge. I would choose the I Spy Private Eye game. My favorite Briarpatch game is the I Spy! Preschool game. I like the Beddy Bye Baby over at Briarpatch! I also like the Fancy Nancy Card Game. I would like the I Spy Private Eye and the Animal Soup games. I would like to win I Spy Private Eye. Jackpot is my other favorite game. I love the Animal Soup There's Always One Game!